UP PCS Civil Judge Pre Marks & Cutoff 2018 Check Here. UP PCS Civil Judge Pre Result 2018 Check Here. UP PCS Civil Judge Mains Exam Admit Card 2019 Check Here. UP PCS Civil Judge Admit Card 2018 Check Here. UP PCS Notification is out. UP PCS is recruiting for 610 Civil Judge Post 2019 Mains Posts. You can check UP PCS - Uttar Pradesh Public Service Commission last date, download UP PCS notification, visit UP PCS official website and check other UP PCS Vacancy details.Complete Vacancy and recruitment Details about 610 Civil Judge Post 2019 Mains vacancies in UP PCS are provided below by JobSarkari.Com only for you. Tentative Date of Examination 16/12/2018. Mains Examination 30/01/2019, 31/01/2019 and 01/02/2019. Civil Judge Candidate Must Have Passed Bachelor Degree in Law and Must be Enrolled Under Advocate Act 1961. 306 164 128 12 610. 4.Take Printout of Your Application Form for Future Reference. 5.Online Application Can be Submitted on or Before 18th January 2019. 6.Candidate Have to Send the Hard Copy of Application Form to the Address Given Below. Secretary, UP Public Service Commission Examination Section - 3). 10 Kasturba Gandhi Marg, Prayagraj, Pin Code No. - 211018 on or Before 28th January, 2019. Q. 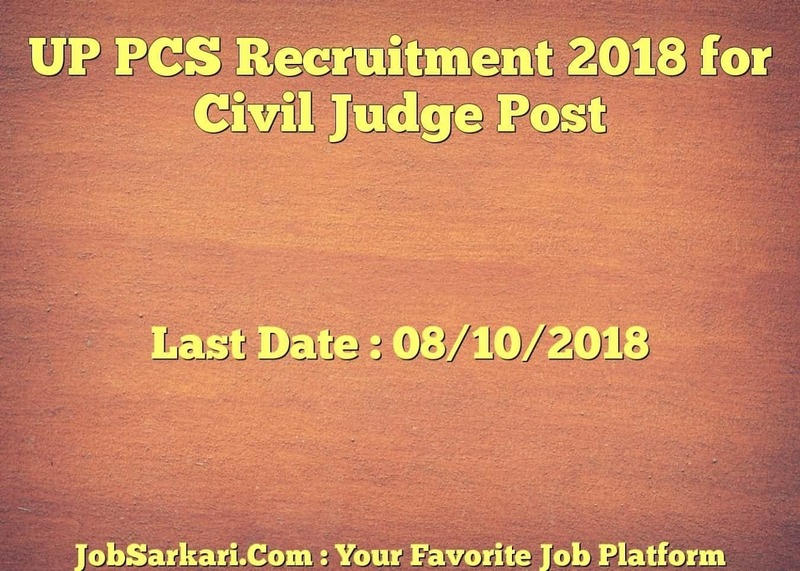 What is the Last Date For UP PCS Civil Judge Post 2019 Mains Vacancy ? A. Last Date for UP PCS Civil Judge Post 2019 Mains Posts is 18/01/2019. Q. 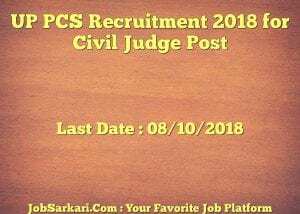 What is the Form Type of UP PCS Civil Judge Post 2019 Mains Recruitment ? A. The Form Type for UP PCS Civil Judge Post 2019 Mains Posts is Online. Q. How many vacancies are available in Uttar Pradesh Public Service Commission Civil Judge Post 2019 Mains Posts ? A. There are about 610 Vacancies in Uttar Pradesh Public Service Commission Civil Judge Post 2019 Mains Posts. Q. What is the Full Form of UP PCS ? A. Full Form of UP PCS is Uttar Pradesh Public Service Commission .